Map 1. Average annual rainfall, amounts in mm. (1921–1950). rainfall, expressed in Ereẓ Israel particularly at the beginning and end of the rainfall season, is also mentioned (Amos 4:7; cf. Ta'an. 6b). An impressive description of the results of droughts is available in Jeremiah 14:1–6. Late and strong rains at the beginning of June are as rare and notable nowadays as they were at the time of Samuel (I Sam. 12:16–18). Similarly, three consecutive drought years in the region of Samaria are as rare and notable in the last 50 years of rainfall measurements (1931/32, 1932/33, and 1933/34) as they were at the time of Elijah and Ahab (I Kings 18:1). Map 2. Interannual variability of rainfall amount, as a percentage of the average for the period 1921/22–1950/51. of weather phenomena: R. Eleazar b. Perata paid attention to the variations from year to year in both amounts and times of rain occurrence (Ta'an. 19b). R. Johanan and R. Papa determined that thin clouds under thick clouds are a sign of rainfall (ibid. 9b); the ragged fragments of low clouds, known as scud (nautical term) or stratus fractus (meteorological term), often moving rapidly below rain clouds, indicate rainy weather (which is also the case today). On the same page in the Babylonian Talmud a weather forecast is given by R. Ulla, using the above-mentioned sign. Even a forecast for the rainfall of a whole year is given in the Jerusalem Talmud (Ta'an. 2:1, 65b). 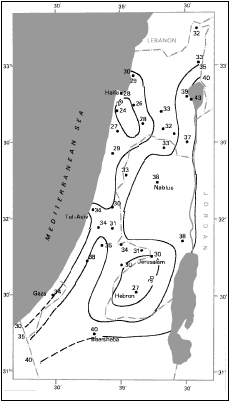 The dates of the beginning and end of the rainfall season in Israel also fit modern conditions (Ta'an. 1:1; Ned. 8:5; see also Yal., Num. 29). As for rain intensities, there are various expressions for slight, moderate, and heavy rains in the Bible (e.g., I Kings 18:45; Ezek. 13:11; 34:26; Ps. 68:10; Prov. 28:3; for the Mishnah see Ta'an. 3). Israel is situated on the boundary of two different climatic regions: its northern half belongs to the southern part of a region having the so-called "Mediterranean" type of climate, whose main feature is that the greatest part of the annual rainfall occurs during the moderately cold winter months, while in the warm summer practically no rain falls; the southern half of Israel, the Negev, is situated on the northern boundary of a hot desert. Like every country with a Mediterranean climate Israel also lies near the limit of the cyclonic rains. Most of the rain-bearing cold lows (barometric depressions) arriving or forming in the eastern Mediterranean during the rainfall season are situated in the northeastern part of this sea (the "Cyprus Low"). Such a depression in the lower layers of the atmosphere is generally associated with a cold barometric trough in the higher layers (upper trough). The great majority of rainfall in Israel is due to this combination, even in the southern Negev – which is far away from the center of the Cyprus Low. Rains usually fall in Israel when cold air masses arrive mainly from Russia, the Balkans, or Turkey. These air masses are cold and dry, but in passing over the relatively much warmer waters of the Mediterranean they are heated in their lower layers, absorb much moisture, and reach Israel in a state of marked instability. Then, the land areas of Israel serve as a "trigger" to induce rainfall. (4) rainfall decreases from north to south, i.e., with increasing distance from the Cyprus Low and decreasing distance from the planetary desert. A good example for the first rule is the Valley of Jezreel where the average annual rainfall decreases gradually from west to east (650 mm.–400 mm. ), and for the fourth rule – the Coastal Plain (650 mm.–200 mm., north to south). In each of these regions there are no significant differences in elevation. The second and third rules are clearly demonstrated on the Carmel range (600 mm.–850 mm. ), where the isolines of rainfall (isohyets) are somewhat similar to those of elevation (isohypses), demonstrating the importance of the height factor. The same applies to two other compact and continuous ranges, namely, Upper Galilee, which is the highest and most northerly region in Israel and therefore the rainiest one (600 mm.–1000 mm. ), and the Judean Hills (450 mm.–700 mm. 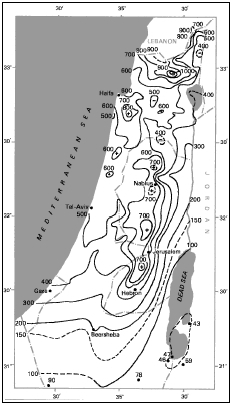 ); whereas the Samarian Hills and those of Lower Galilee are broken up and scattered, so that their isohyets do not take a markedly topographic course. The Samarian Hills, which generally become higher from north to south, demonstrate the prevalence of height over latitude when the latter factor is opposed to the former: this is the only region in Israel where rainfall increases from north to south (500 mm.–700 mm.). In the Jordan Rift Valley, on the other hand, the combined influence of southward progress and falling elevation is seen in the rapid decrease of the average annual rainfall from 570 mm. in the northern part of the Huleh Area to 90 mm. at the northern edge of the Dead Sea. Further south, the Arabah between the Dead Sea and the Gulf of Eilat, forming the eastern border of the Negev, is the driest region in the country (25 mm.–50 mm.). Even the highest hills of the Negev do not enjoy 100 mm. while the northwestern Negev receives 200 mm. as an annual average. In effect rains fall in Israel only during the period October through May, which is called "the rainfall season." The three central rainy months – the "winter" of the temperate climates, December, January, and February – contribute two-thirds to three-quarters of the annual rainfall in most regions of the country. The remaining 30% is distributed among the first and last months of the rainfall season: the "autumn" months October and November and the "spring" months March, April, and May, although in the Coastal Plain the percentage of rainfall in autumn is greater than in the hill region, while in the hills and other regions of the interior the percentage of spring rains is larger than near the coast. In addition to this west-east variation of the rainfall regime there is a north-south variation: while the northern half of the country has a Mediterranean rainfall regime with the characteristic steep increase from the beginning of the season toward the peak month and a rapid decrease from then to the end of the season, no specific month can be singled out in the central and southern Negev as having a marked maximum, and the curve typical for the Mediterranean regime becomes ill-defined. All the preceding facts are true with respect to a normal rainfall regime, i.e., a seasonal distribution of rainfall in which each month receives its average value. But in fact there are large variations from year to year in the seasonal rainfall, and particularly in its monthly distribution, so that it is difficult to find a season in which each of its months has even approximately received its average amount. There are several statistical methods for measuring quantitatively the variations of annual rainfall from year to year. One measure, called Relative Variability, is defined as the percentage ratio between the mean deviation of individual annual totals from their average and the average; another measure, Relative Interannual Variability, relates, in percent, the mean value of absolute differences between successive annual totals to the average. The values of each of these measures of variability are relatively low (20%–26% RV; 25%–37% RIV) in regions with much rainfall (the hill region and Coastal Plain) and higher (≥ 27% RV; ≥ 38% RIV) in regions with less rainfall (the Jordan Valley and Negev). This property is of important consequence to non-irrigated areas in the eastern and southern parts of Israel in drought years. For charts, tables, and further details see bibliography. See *Rain , Prayer for; *Israel , Land of (Climate). D. Ashbel, in: Aklim Ereẓ Yisrael la-Azoreha (1951); idem, in: Leksikon Mikra'i, 1 (1965), 94–103; N. Shalem, in: Desert Research… (1953), 153–64; N. Rosenan, in: IEJ, 5 (1955), 137–53; idem, in: UNESCO (ed. ), Symposium on Changes of Climate… (1963), 67–73; idem, in: Atlas of Israel (1970), sheet IV/2; J. Katsnelson, in: Archiv fuer Meteorologie, Geophysik und Bioklimatologie, 13 (1963/65), 163–72; idem, in: Ha-Enẓiklopedyah le-Ḥakla'ut, 1 (1966), 27–62; idem, in: Gishmei Ereẓ Yisrael ke-Gorem Yesod be-Meshek ha-Mayim shel ha-Areẓ (1968/69).